Most people quickly learn how to make good food choices for losing weight. 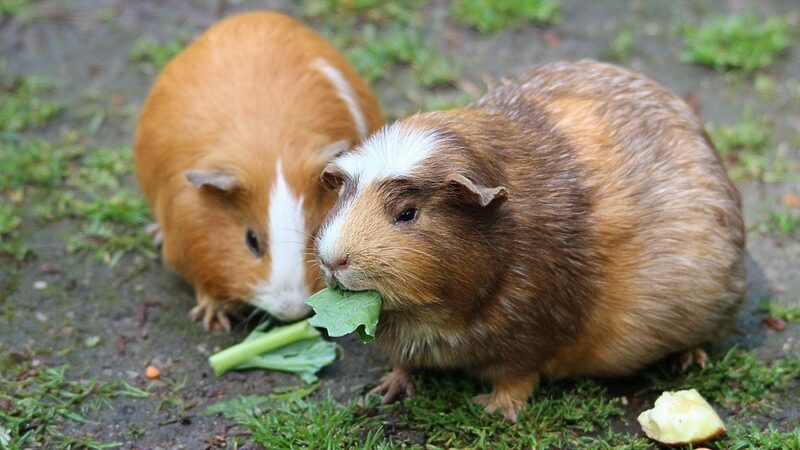 they know that their diet should be predominantly made up of fruits, veggies, grains, and lean protein sources with a few treats thrown in here and there. In these situations, the problem isn't with their main meals, but rather the mindless snacking that goes on in-between. In fact, I consider mindless snacking to be the biggest culprit keeping people overweight despite the hard work they put towards their diet and exercise routine. When I began working with a new online coaching client, the first thing I have them do is record a few days of eating. This allows me to get a feel for their nutrition habits and meal routine so that I can optimize their plan with me. 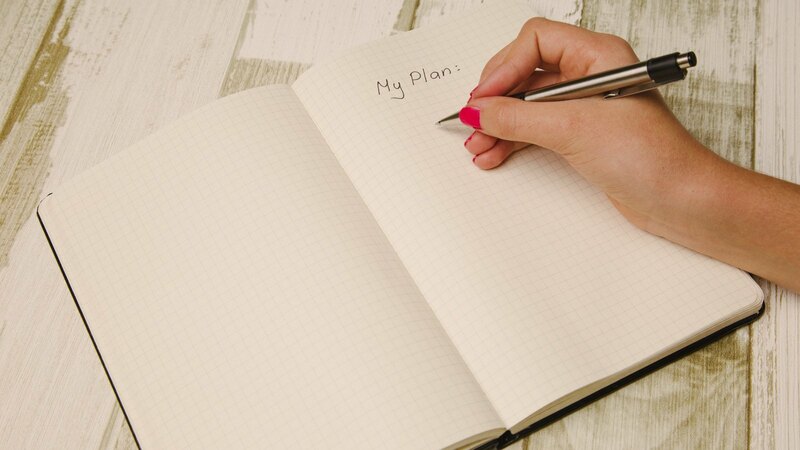 I recently had my newest client – let's call her Cindy – complete this task, and after she was finished, we hopped on the phone to go over her 3-day food diary. According to her food log, Cindy was only taking in around 1300-1400 calories per day spread across 3-4 meals. Additionally, those three meals were chock-full of healthy fruits, veggies, whole grains, and a surprisingly high amount of protein for someone who's never consciously tried to eat higher protein foods. Cindy is 5'7" and owns a hair salon where she spends the majority of the time working on her feet. Because of her size and activity level, there's simply no way that 1400 calories provides enough food to satisfy her metabolism, let alone cause her to gain weight! How does she prepare her meals? What type of liquids does she drink throughout the day? Although Cindy was making fantastic food choices for her three main meals of the day, we figured out that it was the snacking in-between her meals that was causing her weight loss to suffer. Cindy cares about her customers and one way she shows her appreciation is by providing a complimentary spread of free finger foods and snacks. She leaves out healthy options like vegetable platters, hummus dips, and mixed nuts. The problem, though, is that Cindy ends up restocking the snack table, and each time she "grabs a little bit here" or "finishes off a few bites there..."
Her small handful of almonds with a few veggies dipped in hummus is only around 150-225 calories at most, and because it's just a small handful of food, it never crossed her mind to log it. But the problem is that Cindy is usually restocking the table a few times a day – taking small handfuls each time – which has been causing her to unknowingly consume an extra 600 to 1000 calories by the end of her shift! She's not the only person who's unintentionally taking in more calories than expected. Think about it: someone could assume they're consuming 1,600 calories per day but instead be taking in closer to 2,400+ calories. Depending on the person's calorie needs, it may be enough error to completely offset their calorie deficit. While some people may be knowingly underreporting their intake, the majority of individuals, like Cindy, are completely unaware and often shocked to find out just how many extra calories they are taking in through mindless snacking and other diet ambiguities. Why Is Mindless Snacking So Common? You don't see many people mindlessly snacking on raw carrots and blueberries. If they are, it's probably not much of a fat-gaining problem. Most people who are mindlessly munching are reaching for prepackaged and processed foods which are high in sugar, salt, fat, and calories. These types of food are engineered to drive our taste buds wild, and we are bombarded by them everywhere we go. Processed junk foods are also cheap and have a seemingly infinite expiration date – making it easy for them to accumulate in your kitchen cabinets, cupboards, and countertops over time. What's more is people usually go for junk food when they're sad, happy, stressed, annoyed...really, every emotion typically leads to intensified cravings for sugary and salty snack foods. For me, it was Oreo cookies. When I was struggling with my weight, Oreos were my go-to snack when I was tired, stressed out, or just wanting to relax. It wasn't uncommon for me to take down an entire sleeve (roughly 1/3 of the package) either. The biggest reason why mindlessly snacking is a problem is due to the high-calorie density of most people's snack food choices. Processed snack foods – chips, cookies, pretzels, etc. – come with a boatload of calories for a relatively small amount of volume. As a result, it's easy to mindlessly take in hundreds of calories eating them throughout the day without feeling any fuller or the need to reduce the quantities of your other meals. And because most people have an "all or nothing" mindset with dieting, by the time they catch themselves snacking, they assume it's too late to stop and end up finishing the entire bag of Doritos. "I've already gone this far, might as well make it worth it!" They live in a constant state of overeating and dieting and never make noticeable progress towards their fat loss goal. In order to lose weight consistently, and keep it off for good, you need to step back and think about your relationship with snacking. 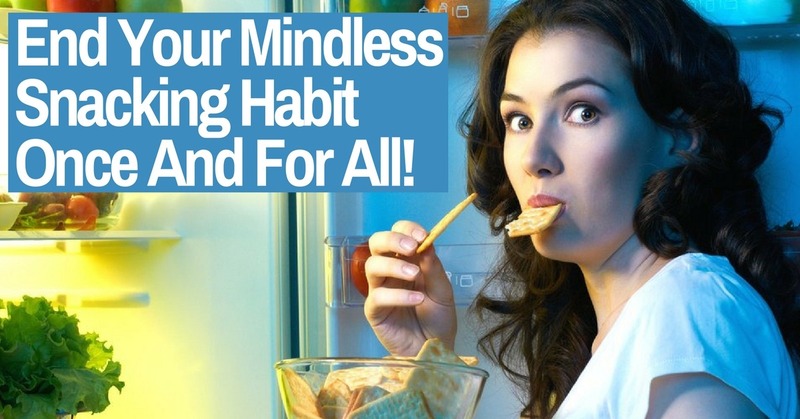 Do you find yourself mindlessly grazing on food during the day? Are you supposedly taking in very few calories, but still struggling to make progress? Mindless snacking is likely to blame, and here's how to fix it. If you aren't monitoring your daily food intake, you're only making it easier for yourself to mindlessly snack throughout the day. But if you are keeping a log of all of your meals and calories, you'll be less likely to snack on high-calorie junk foods. Tracking calories won't guarantee you stop mindlessly snacking, but it's a great first step towards conquering it. Seeing these two handfuls side-by-side, it's easy to see the difference in portions. But imagine if you were just mindlessly grabbing a handful? For someone who's never tracked or weighed their food before, it wouldn't be surprising if they unknowingly served themselves 200-300 calories more than they intended to. Fortunately, by following the first strategy (tracking calories), you'll already be controlling portion sizes through consistently weighing and measuring your food intake. The best way to control your portions is to use an accurate method for measuring your food such as a food scale or accurate measuring cups. In those situations, I've found a simple method for semi-accurately estimating portions is to use your hands as a guide. One of your primary goals while dieting should be to decrease hunger as much as possible, and one of the best ways to do this is by consuming plenty of whole fruits, vegetables, and lean protein sources. Whole fruits and vegetables contain a ton of micronutrients, fiber, and water - all of which lead to fullness and regulation of satiety hormones. Lean protein sources are also filling due to protein's high thermic effect and calorie burn during digestion. The fact of the matter is this: the less hungry you are, the less likely you are to crave snack foods and mindlessly overeat. "Am I physically hungry right now? Or am I just bored?" Most of the time, our snacking is a result of boredom, wanting to relieve stress, or the result of making a habit of snacking while engaging in certain activities like watching tv or driving. But the more you think about your snacking, and WHY you're snacking, the less likely you are to continue doing it mindlessly. Too many people make the mistake of leaving overly-tempting snack foods sitting around their house withing arms reach. I like to call these highly craved foods "Trigger Foods," and if they are in your kitchen, it's only a matter of time before you start snacking on them. We all have certain foods that we struggle to control ourselves around. So instead of keeping these foods in your immediate environment, make them "Go-Get" snack. A "Go-Get" snack is a food that you keep out of your house or living area. The only way to get these foods is to physically go to the store and buy them. Mindless snacking is more likely to occur if you have a plethora of tempting junk foods lying around. So by keeping these foods out of your house, you'll probably find the task of getting up, putting on your coat, leaving the house, driving to the store, spending money at the store, and driving back home just to buy the food isn't worth it. This strategy works synergistically with the worst case scenario of the previous strategy. If you don't have any foods to snack on in your house, but your urge to snack is strong enough, you may end up driving to the store to buy high-calorie junk foods anyways. However, if you have plenty of low-calorie snacks ready to eat (i.e. apple slices, grapes, Greek yogurt), you'll be able to satisfy your desire to snack without consuming 500+ calories from junk food. The majority of my clients have great success with planning out most of their meals. It's a way for them to have healthy snacks ready to eat for times when they crave snack foods the most. If you have dinner at 6 pm and tend to get hungry before heading to bed at 10 or 11 pm, why not be ready and have a pre-prepared snack ready to much on? Not only will this help you avoid making an impulsive decision, but you'll also be able to snack without feeling guilty about going over your calorie goals for the day. 8. Stop Being "All or Nothing"
A lot of dieters struggle with an "all or nothing" mindset. Unfortunately, this type of mindset can turn a small hiccup in your diet into a fat-gaining nightmare. You planned your meal out ahead of time and feel confident that you're going to have fun and socialize without worrying about blowing your diet. 1. Accept the fact that you are going to go over your target calories for the day, and be OKAY with it. 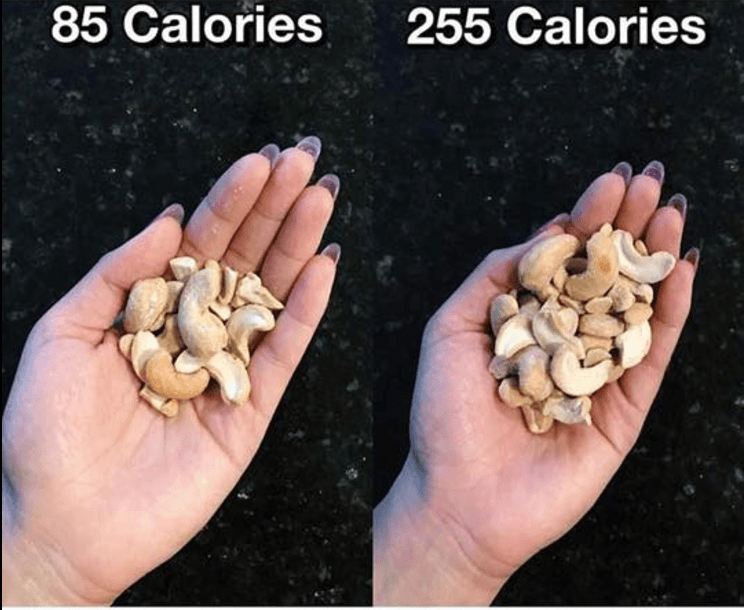 In the grand scheme of things, ~250 extra calories will do virtually zero harm to your fat loss progress. 2. Feel ashamed and frustrated with yourself, assume the day's already shot, say "EFF IT," and go on an overeating rampage. Withing an hour, your little chip surplus turns into a dieting massacre of Mexican margaritas and post-restaurant Dairy Queen Blizzards. I don't know about you, but scenario numero uno sounds much more enticing. The short-term gratification from the second scenario isn't worth the long-term guilt and frustration it will cause. 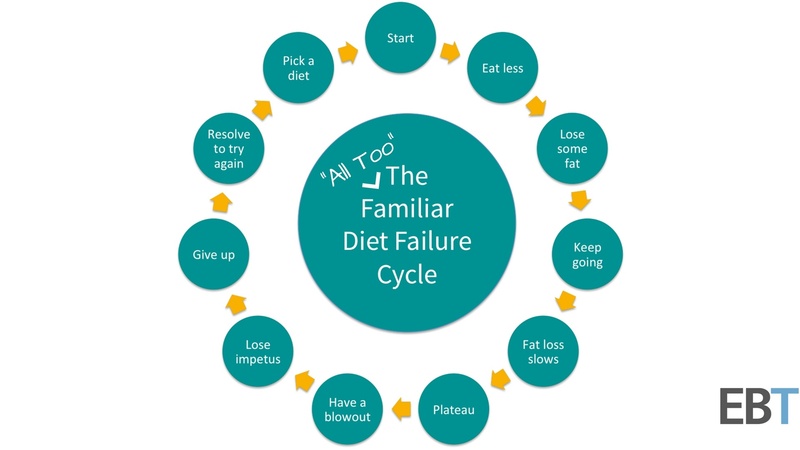 When you find yourself in a situation where you've gone over your nutrition targets, first, don't panic. Realize that small hiccups won't result in much, if any, set back in your weight loss progress. Get back on the plan, and forget it ever happened. Mindless snacking is a grievance to many struggling dieters, but by following the strategies outlined in this article, you can eliminate this fat-gaining habit and even transform it into a fat-burning habit that aids in your weight loss progress. 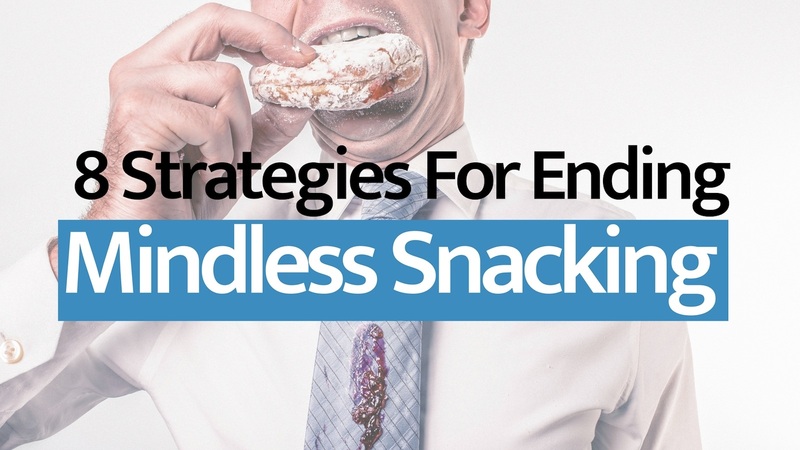 At the end of the day, though, mindless snacking is just one of many obstacles that may be keeping you from losing fat and achieving your fitness goals. Fat Loss Forever is my free 14-day ecourse with the purpose of teaching you how to finally lose fat, and keep it off for good. It includes the most effective fat loss strategies and tactics that I have used in my own weight loss journey as well as in helping my clients achieve their fitness goals. 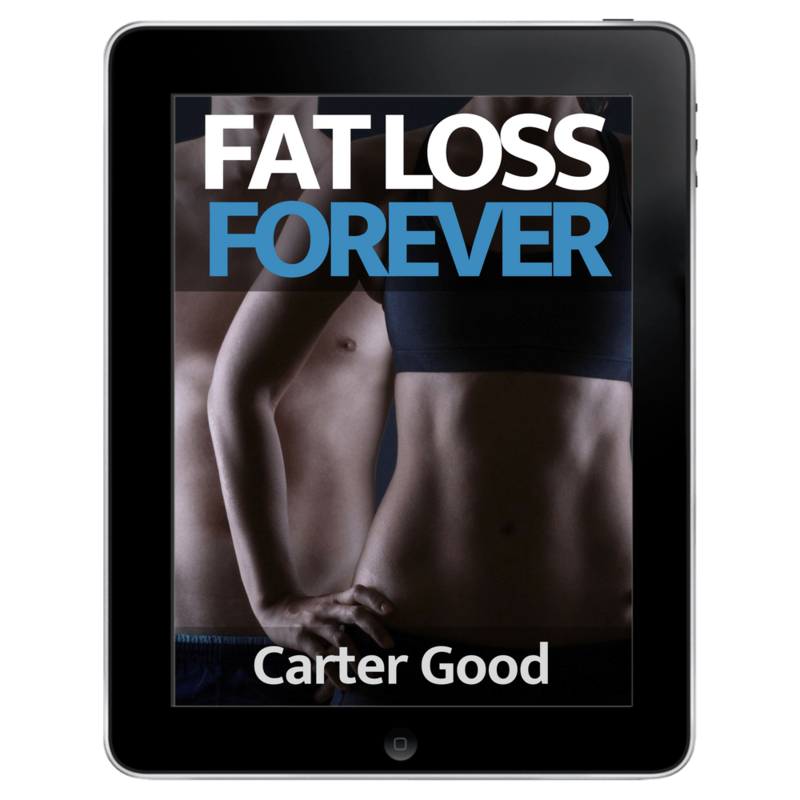 Fat Loss Forever is for folks who are tired of yo-yo dieting and struggling to get results and is ready to lose fat forever. Does that sound like you? If so, then click the button below to enroll for free and you'll get instant access.